An 84-year-old priest was killed in an attack during a hostage-taking situation at a church in northern France, near Rouen. 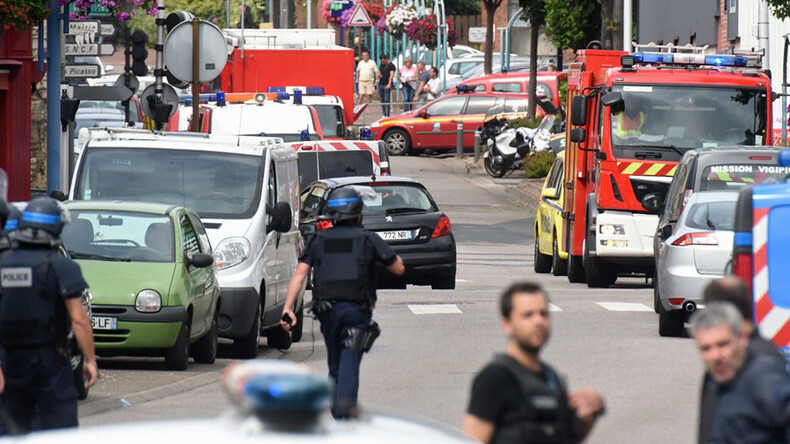 ISIS has claimed responsibility for the attack, carried out by two terrorists who were later killed by police. Both attackers were killed by police snipers after running out of the church at one point during the standoff, an interior ministry spokesman said. Police have also officially confirmed the death of one victim, who was "killed with a blade." Security forces have arrested one person allegedly linked to the attack, according to a source close to the investigation, as cited by Reuters. Police earlier said they could not confirm the motive or the identities of the attackers. In an official statement, France's President Hollande called the attack a "terrorist act," and said the attackers claimed a connection to IS. He added that France needs to battle against IS. "Daesh has declared war on us, we must fight this war by all means, while respecting the rule of law, what makes us a democracy," he said, as cited by Reuters. IS has officially claimed responsibility for the church attack via its Amaq news agency, saying that two of the group's soldiers carried it out to target what IS calls 'crusader coalition' countries. One of the attackers wanted to go to Syria in 2015, but was seized in Turkey and deported back to France. He was arrested in May 2015 and spent almost a year in prison, before being released on March 2. He has since been required to wear an electronic bracelet. Upon his release, he returned to his parents' house to live, French broadcaster iTele reported. The attackers briefly held a total of five people. One of the hostages was seriously wounded, interior ministry spokesman Pierre-Henry Brandet said. SWAT and anti-terrorist units, as well as firefighters, promptly arrived at the scene. The premises are now being searched for explosives, Brandet said. The Paris anti-terrorist prosecutor is launching an investigation into the church attack and hostage-taking situation. "Don't break the security perimeter to take photos/videos, you're interfering with the police work," local police warned on Twitter. [#SaintEtienneDuRouvray] Ne franchissez pas le périmètre de sécurité pr prendre des photos/vidéos, vous perturbez le travail des policiers. Local media say that a female worshipper alerted the police. The Vatican has condemned the "barbaric killing" of the priest in the attack. "We are particularly shocked because this horrible violence took place in a church, in which God's love is announced," Vatican spokesman Father Federico Lombardi said, according to Reuters. Father Jacques Hamel, who was killed in the attack, was 84 years old. He had served as a priest for 58 of those years. French President Francois Hollande and Interior Minister Bernard Cazeneuve arrived at the site of the attack.